It’s a curse. Especially if one is waistline challenged pre-spinal cord injury. It appears to me that there are at least three possible demons that tug at the waistline post spinal cord injury, threatening to plus size the wheelchair occupant. 2. Boredom - for many activity becomes limited as one finds themselves planted in front of the TV set for days on end. As you stair at this “box”, the other box you find entertaining is the refrigerator. You stare at it as it stares back, enticing you with all sorts of goodies to help you alleviate the boredom, ease the pain and pass the time. Nothin’ else to do…let’s eat! Once it goes on, it’s hard to get off! Now that your activity has decreased (above) and you’re not burning off the calories, you find yourself adding even more calories to your idling engine. 3. Drugs - several may have an effect on metabolism however one that is often prescribed for spinal cord nerve pain is Lyrica and it has been implicated in weight gain. There is probably fluid retention due to the fluids not being pumped as vigorously by moving legs and other physical action etc. Some drugs (Lyrica) are removed from the body by renal excretion and if renal function is impaired by injury or the drug itself, fluids might accumulate. This my translate as swelling in the legs, hands and/or feet. 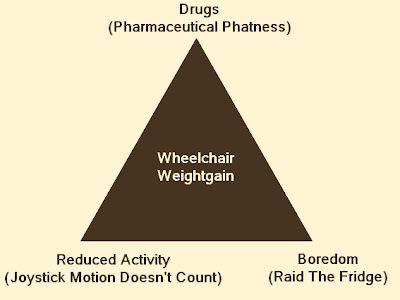 So, once a spinal cord injury occurs, the fight to keep weight off may be a problem. This of course depends on one’s metabolism, severity of injury, health prior to injury and self discipline both pre and post injury.